I took this wintry picture some days ago. Most of the snow has melted now. I like the trees in the foreground. Oh my! Such interesting trees! This is a great winter scene. I looks like a cold wintery day! Oh, this is wonderful & I so like those trees too..
A wonderful but cold winter's scene ! The two bollard trees look like two guards in front of the house ! Your lovely roof line again! The roofs look so tidy tucked in at the corners....hospital bed roofs! 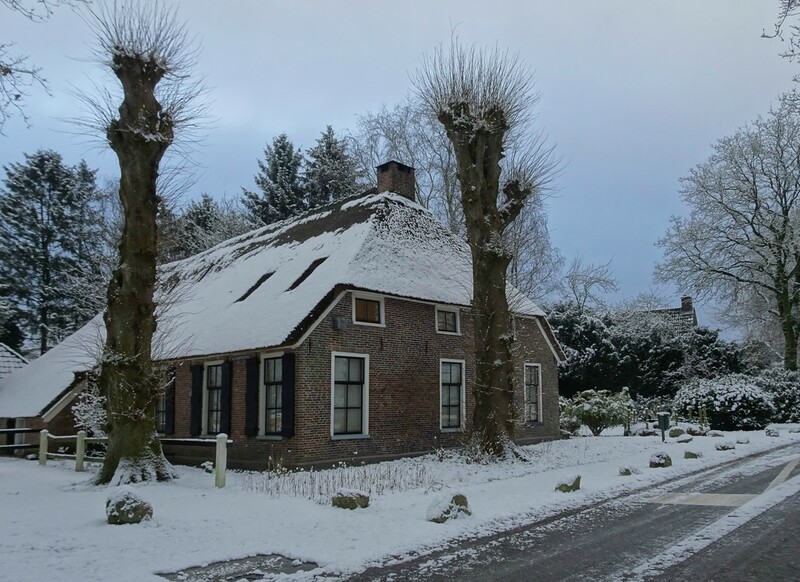 Mooie boerderij en winters tafereel. @happypat Agreed. Never noticed before. Great snow scene. Love how your pov emphasizes the two pollard trees. I agree they look like as were they guarding the house. fav. Great house! Love how it looks with the snow!